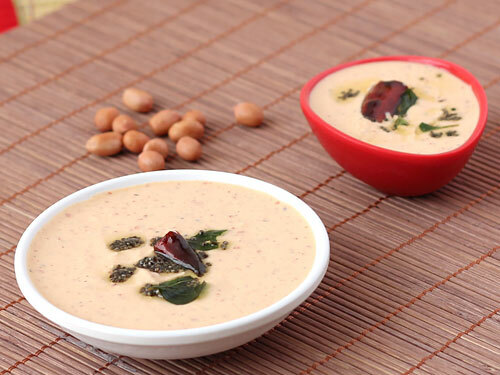 Peanut Chutney, a versatile and easy to make spicy chutney, is a must have accompaniment in south Indian cuisine. It can be of two types, wet and dry. 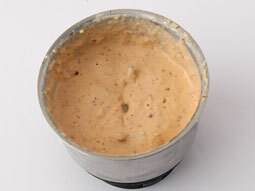 This recipe is for making wet peanut chutney for dosa and idli and it can be used either as spread or as an accompaniment. 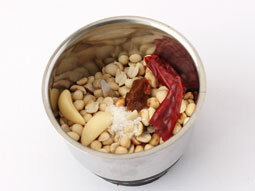 Take roasted peanuts, garlic, 3 dry red chillies, tamarind paste and salt in a chutney jar of grinder. 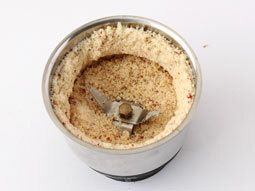 Grind them together to make a medium coarse powder. Add 1/2 cup water and grind again until smooth paste. Transfer paste to a serving bowl and proceed to prepare tempering. Heat oil in a small pan. Break 1 dry red chilli into two pieces. 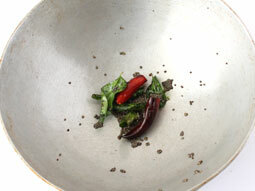 Add mustard seeds; when they start to crackle, add curry leaves and remaining 1 dry red chilli. Sauté for 10 seconds and turn off flame. Pour tempering over chutney paste. Chutney is now ready to be served with steamed idli and dosa. If roasted peanuts are not available, then you can dry roast them over low flame in a heavy based pan for 7-8 minutes. Let them cool for 3-4 minutes and remove the skin. Increase or decrease the amount of red chillies to make more or less spicy respectively. Adding more chillies will in fact make it Andhra style spicy peanut chutney. You can avoid topping it up with mustard seeds tempering if you are going use it only for making dosa. Serving Ideas: It can be served with south Indian dishes like steamed rice, rava idli, rice idli, plain dosa, masala dosa, medu vada, etc. 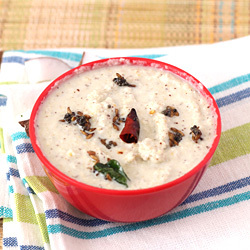 Enjoy it as a spicy condiment with rasam-rice or sambhar-rice. Really nice and detail information with picture is excellent. Thanks it's so delicacies. And very tasty. I tried this chutney and liked it very much, it was really very very tasty. Excellent, tasty and easy to make. Thanks for sharing. Thanks for the coconut chutney receipe.. loved it!! Response: Follow the given url to get the step by step photo recipe of Lauki ka halwa - http://foodviva.com/desserts-sweets-recipes/dudhi-halwa-recipe/ . i have tried these recipes .they have come out well and delicious that we are always willing to eat these recipes. Hi, thank you so much for sharing this recipe. It has come out well and is so delicious too. I love this easy way to make chutney. Hi, thank you so much for sharing this recipe. It has come out well and is so delicious too. Keep up the good works.